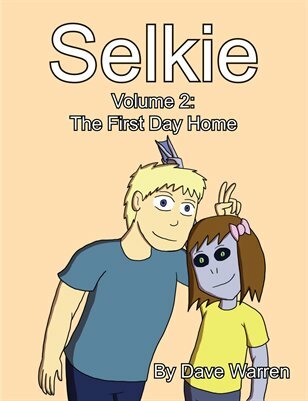 Up until now, with the exception of Todd we’ve only seen Selkie interact with people who were already accustomed to her (the kids and caretakers at the orphanage). Even Todd was a little weirded out when he first saw her. The reactions of the general populace to Selkie is something I have been eager to explore for awhile now, I am quite glad to have reached this point of the story. I know some of you were wondering about the end results of Selkie’s Dress Up Montage in the previous strip, and I don’t wanna call your collective bluffs on the pitchforks and torches (Angry Mob casts Fire Wall! Critical Hit! It’s Super Effective! Dave has fainted…). So, the canvas tote bag Selkie is hugging contains the newsgirl outfit, the pajamas (note the bear paws sticking out), the triceratops dress, and (of course) the green butterfly dress she came in with. Thank you for the cute-splosion Cee! Awesome strip! I was asking about peoples’ reactions last time. Now I know! And knowing’s half the battle! Huuhhh… Why do I see this ending badly, or at least very awkwardly? Sad thing is, Todd is going to have to repeat this song-and-dance quite a few times in the future, I’m sure. I’m sure he’ll get good at it. Probably enough that he doesn’t even have think about what to say. I have know people like that, they really are trying to be pleasant and polite but some of the questions and side comments make me think they spent way to much time sniffing glue. Jessie’s in for a smackdown right there. Either Todd explodes, Selkie explodes (having overheard the comment), or Todd simply takes Selkie away and says “Come on, we’re leaving.” Oy gevalt*, this will not be pleasant. *I’m Jewish and therefore can get away with throwing around random Yiddish phrases like “oy gevalt” when I feel they are appropriate. Btw, Happy Hannukah everybody! Her not knowing why Selkie is the way she is is not a valid reason to throw a fuss or storm out of the store. 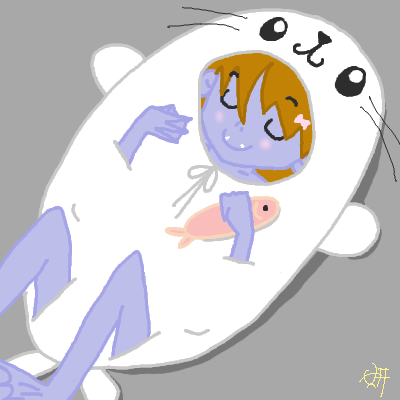 I want to see selkie happening upon a seal, and then it goes dooooooooooooo. Then she is like battling the seal final fantasy style. Now you got me curious as to how Todd will explain Selkie’s apperance to others. Such as an illness, thats she’s an alien or just pass it of as a genetic anomoly or even tell the truth, whatever that may be. I dunno, the fact that she’s adoptable rather than living in a government lab says that non-humans aren’t *totally* unheard of in this world. I just really like it that the clerk’s reaction is concern for Selkie’s health, not “aiiiee monster”. I always though she was more of a gray. And this is a legitimate question. It’s only rude if you ask it twice. Or stare. Uh oh. This might be awkward! An issue they’ll both have to face. I would think Selkie has actually had more experience with this than Todd, being unique in the orphanage at least. Kids can be astoundingly cruel to perceived outsiders, so it’s believable that she can cope (to a degree) with stares and rude comments. Still, now that Todd has shown her that a relative stranger can be supportive, her expectations might be raised, so she expects (with justification) more acceptance and less prejudice from people… and we’ve seen that Selkie has no problem asserting herself. I know that this is ether late in asking or story mystery but dose the world know of selkies? And if so or if not then to what extent? Her species is not commonly known, or large in number. Well, one can’t exactly blame Jessie for being curious about Selkie. After all, she is different. Perhaps if Todd explains that yes, he just adopted her, that she is his daughter, and she is a normal, sweet, feisty little girl who loves life, Jessie will know Selkie better. They might even become friends! Appearences can be easily misread or over scrutinized. And yes, undoubtedly Todd and Selkie will have to face cruel people in the future who cannot see the true beauty of such a special child. The good news is the will face these people together as father and daughter. And I’m sure Selkie will have plenty to say and change lives! Hearts may turn you blue, but she’s purple. I’ve been reading since the beginning and I like to story so much and I just wanted you to know that your art is really improving as you go and I know you’ll only get better! Todd has to explain to the shoe clerk that it’s not catching, or the shoe clerk won’t show Todd the proper way to fit shoes. Is that a heart above Selkie’s head in the first panel? “It’s a genetic condition” is both true and vague enough to discourage further questions. Todd better get used to that. And to people acting as if Selkie’s retarded because of her odd appearance/manner of speaking. Yes, but her name being Selkie doesn’t mean her race is selkie. My friend Bear isn’t a bear :P.
And I reiterate: SELKIE IS GREY. The last two strips have been pure awesome-cuteness! I’d have to agree with Rainne, the term “genetic condition” might be a good explanation to fall back on. … And now the plumber is here and I’ve forgotten what else I was going to say. :-/ Pfui! Todd may have a harder time dealing with Jessie’s comments than Selkie. Selkie may be used to it, given her somewhat muted reaction to being called “fish face” by Amanda back in #17. Todd, though, as a brand new Papa Bear, may have trouble keeping his claws in. P.S. Thanks for going with the blue seal dress — and I love Selkie’s expression in Panel 1!